This volume takes up bankruptcy in early modern Europe, when its frequency made it not only an economic problem but a personal tragedy and a social evil. Using legal, business and personal records, the essays in this volume examine the impact of failure on business organizations and practices, capital formation and circulation, economic institutions and ethics, and human networks and relations in the so-called "transition" to modern society, from the early-sixteenth to the early-nineteenth century. One group of essays concentrates on the German-speaking world and shows a common concern for the microeconomics of bankruptcy, that is, for such issues as the structure of the firm, the nature of its capital, and the practices of its partners, especially their assessment of risk. 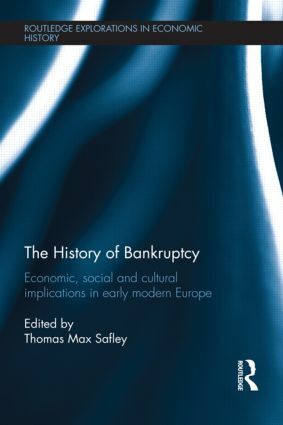 Another group of essays shifts the focus from Central to Western and Northern Europe and away from the microeconomics of the early modern firm to an institutional consideration of bankruptcy. The final group of essays turns to Southern Europe, especially the Mediterranean basin, to assess bankruptcy not as an unfortunate result of crisis, but as an intentional response to crisis. All of the contributions are the result of original research; many of the scholars publish in English for the first time. All of the chapters are founded on close archival research, offering insights not only into business organization and practice but also into social and cultural aspects of economic life from the late sixteenth to the early nineteenth century.